Thousand Oaks, CA – March 2019…Williams, renowned for digital pianos that deliver sound and features far above their price class, is pleased to debut the Allegro III Digital Piano. This portable instrument is ideal for the advancing student or the professional player who requires top-quality sounds and authentic keyboard feel. 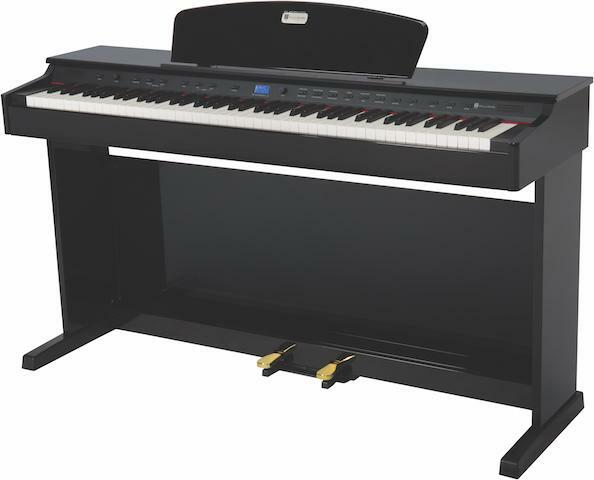 The 88 keys of the Allegro III are fully weighted, providing the response, resistance, and nuanced control upon which music teachers, serious students, and performing artists insist. Featuring a new generation of Allegro keyboard design, this action is coupled to ten high-resolution instrument voices taken from the Williams Custom Sound Library, including grand pianos, electric pianos, organs, strings, bass, and more. All are recorded from the finest instruments and sampled at multiple velocity layers to achieve full dynamic range and tonal realism. The sounds are lushly reproduced through the built-in four-speaker speaker system for outstanding volume, clarity, and frequency response. Wireless MIDI via Bluetooth® lets players connect the Allegro III to an iPhone® or iPad® to experience educational apps such as McCarthy Music Piano, which offers fun, interactive lessons from the world’s largest online music school (including a free live remote lesson with an expert piano teacher). In addition, the Williams Piano app unlocks hidden capabilities of the Allegro III, giving the user fine-grained control over tones and effects, as well as bonus features to improve keyboard skills. Rounding out the feature set is a built-in metronome, the option to run on batteries or the included AC power supply, a sustain pedal, and a sturdy music rack that accommodates thick music books or full-sized iPads with ease. An optional matching stand puts the Allegro III at the correct height of an acoustic piano’s keyboard and imparts a dignified presence in any home. The strongest asset of the Allegro III, though, is the value that has become synonymous with the Williams brand. No other digital piano combines this quality of sound and playability at this price. Williams Allegro III will street for $329.99 and at Guitar Center stores, guitarcenter.com and Musician’s Friend. Visit www.williamspianos.com to learn more about the full line of Williams digital pianos. Thousand Oaks, CA – October 2018…Williams, a leader in versatile, cost-conscious digital pianos, is now shipping the Legato III digital piano. 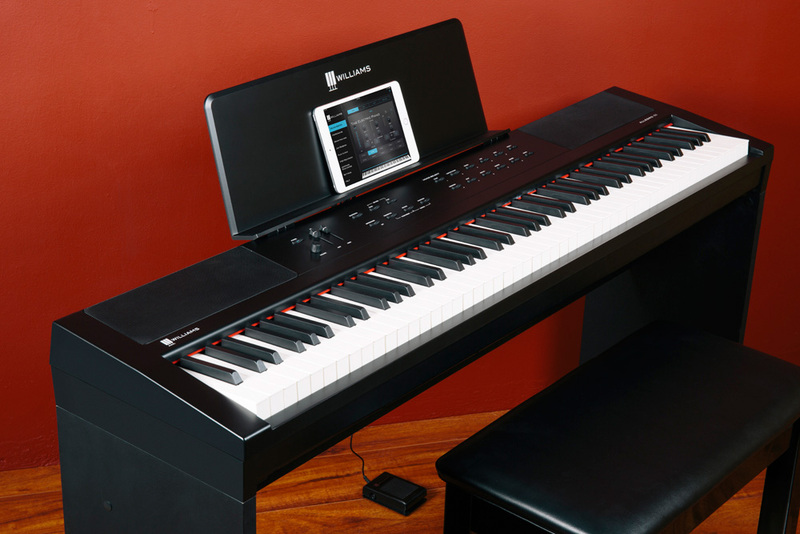 A full-size digital piano with 88 touch-sensitive keys, the Legato III features 10 high resolution voices from the Williams Custom Sound Library, including acoustic and electric pianos, organ, synth, and bass. Built-in, full-range, dual-driver speakers deliver these lush tones with outstanding clarity and room-filling volume. 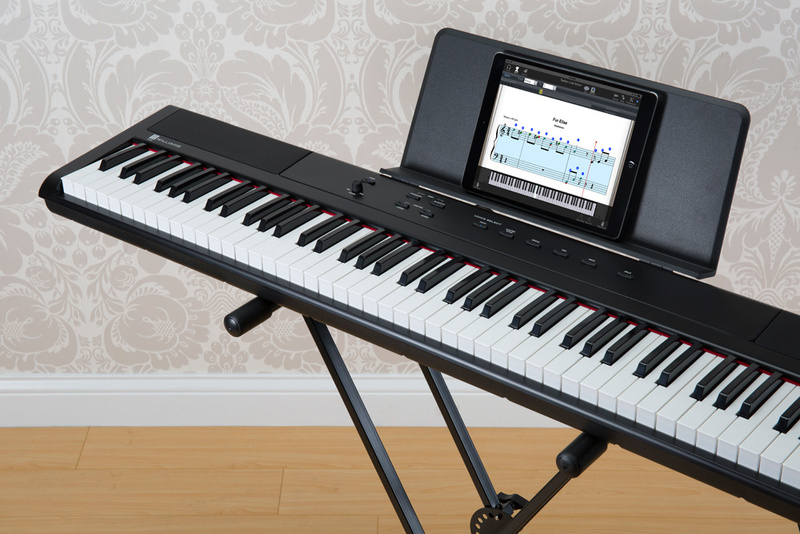 Bluetooth® MIDI capabilities enable the Legato III to connect wirelessly to an iPhone® or iPad® so you can run educational software, such as the McCarthy Music Teaching app. A free live remote lesson is included with the purchase. Williams’ unique iOS app provides easy access to the Legato III’s advanced menus, as well as offering self-teaching aids. The Legato III’s solid music rest is easily strong enough to support an iPad or sheet music. A built-in metronome helps you practice your timing and sense of tempo. 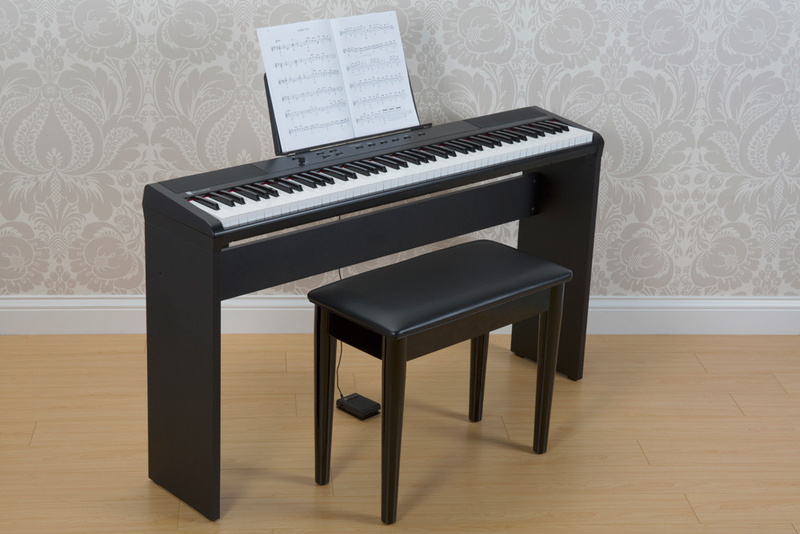 The instrument can operate on AC or battery power, so you can take it with you and play it anywhere, and the power supply and sustain pedal are included. 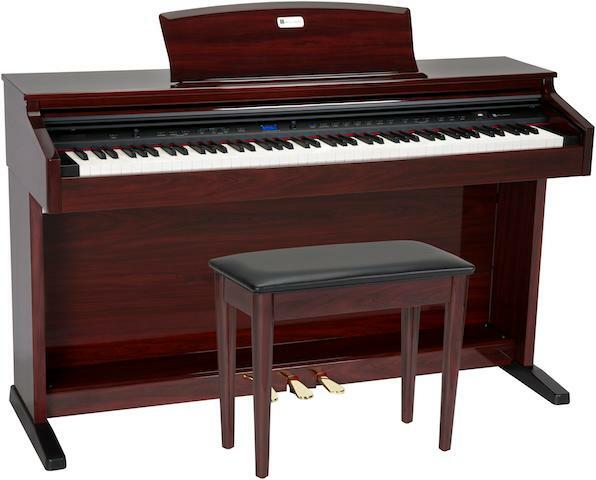 As with all Williams digital pianos, the Legato III is an exceptional value with a street price of $229.99. It’s in stock now at Guitar Center retail stores and is available for immediate shipment from Musician’s Friend and guitarcenter.com. Thousand Oaks, CA – August 2017…Williams, a leader in versatile, cost-conscious digital pianos, unveiled several gorgeous new finishes for its Overture 2, Rhapsody 2, and Symphony Grand digital pianos. The new styles are available immediately. 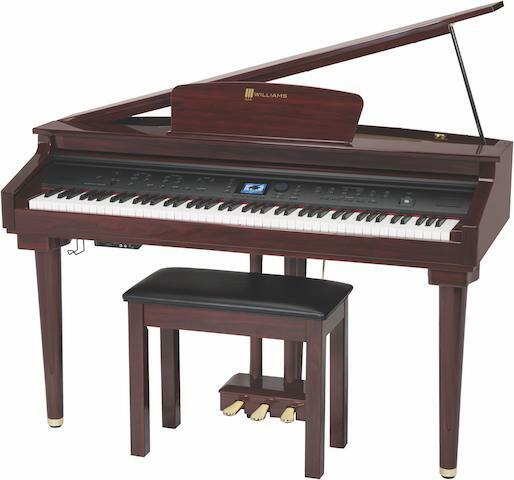 The ultra-affordable Williams Rhapsody 2 88-key digital console piano has been available in a PVC wood-like finish; now you can get it in luxurious ebony gloss as well. This versatile instrument delivers 12 high-definition sounds (32 MB of sample ROM), including a dark grand piano for classical performances and a brighter instrument for rock and pop. Add a transpose function and Sustain and Sostenuto pedals, and you have an incredibly expressive instrument that is a delight to play and hear. Rhapsody 2’s built-in stereo sound system provides immersive sound for a rich musical experience. Previously offered in a classic ebony gloss finish, Williams’ Overture 2 88-key digital console piano is now available with an equally stunning red mahogany gloss finish, as well. Overture 2 offers many features not normally found in its price class. A four-speaker stereo sound system provides an immersive musical experience with rich detail. You get a generous sound library with 15 high-definition custom sounds (64 MB), plus a complete General MIDI sound set. The instrument sports Sustain and Sostenuto pedals, as well as a Soft pedal, as found on acoustic grand pianos. Its Duet keyboard mode is great for teachers and students, as well as for performing duets for an audience. In addition to the USB/MIDI connection for recording and control, a USB Host Port can play MIDI files from a thumb drive and a built-in, two-track recorder. Overture 2 also includes Song Tutor with 50 play-a-long songs. A metronome, music rest, audio inputs, two headphone outputs, and 1Ž4″ stereo out jacks complete the package. A thoroughly modern instrument with classic styling, Williams’ micro-grand-style, 88-key, graded hammer-action Symphony Grand digital piano was previous offered in ebony and now is also available in elegant red mahogany. 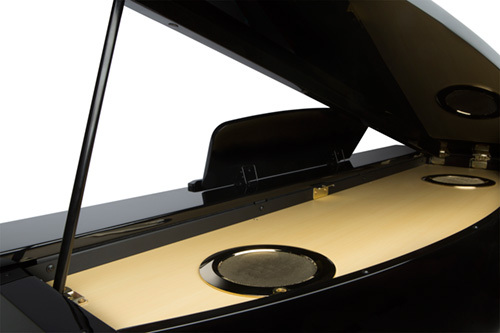 An outstanding instrument that will delight players at all levels, the Symphony Grand features a keybed with authentic response and playability and boasts 174 voices (192 MB of ROM samples) and 128-voice polyphony. You get Sustain, Sostenuto, and Soft pedals, as well as piano effects such as adjustable pedal noise, key noise and a sustain layer that reproduces sympathetic resonance. A Mod/FX feature delivers authentic rotary effects on organs and vibrato on electric pianos. Its six-speaker stereo sound system ensures every note sounds rich and clear. Connections include Bluetooth® audio input, USB/MIDI for recording and control, and a USB Host port that plays MIDI files from a USB thumb drive. You also get a built-in two-track recorder, MIDI I/O, stereo 1Ž4-inch and RCA audio inputs and outputs, and a headphone jack. The Symphony Grand includes 120 Style Arranger songs in various genres for real-time playback, as well as a Song Tutor that teaches an assortment of classical, rock, and blues songs. With their combination of visual beauty, including a choice of finishes; high-quality construction; outstanding sounds; and impressive features, the Williams Rhapsody 2, Overture 2, and Symphony Grand are great choices for music students, home performance, churches, schools, and more. At street prices of $599.99 for the Rhapsody 2 in Ebony Glass, $799.99 for Overture 2 in Red Mahogany, and $1,599.99 for the Symphony Grand in Red Mahogany, all are terrific values. They’re available exclusively from Musician’s Friend and guitarcenter.com. Regular Williams user, Kris Nicholson has shot a couple of videos that show him giving a comprehensive review of the Symphony Grand. These are “must-see” for anyone who is interested in the Symphony Grand. The first video shows his first impression when sitting at, and playing, the Symphony Grand for the first time. The second video shows him testing the onboard sounds. Thousand Oaks, CA – March 2016…Williams, a leader in versatile digital pianos, has introduced the Symphony Grand digital piano. 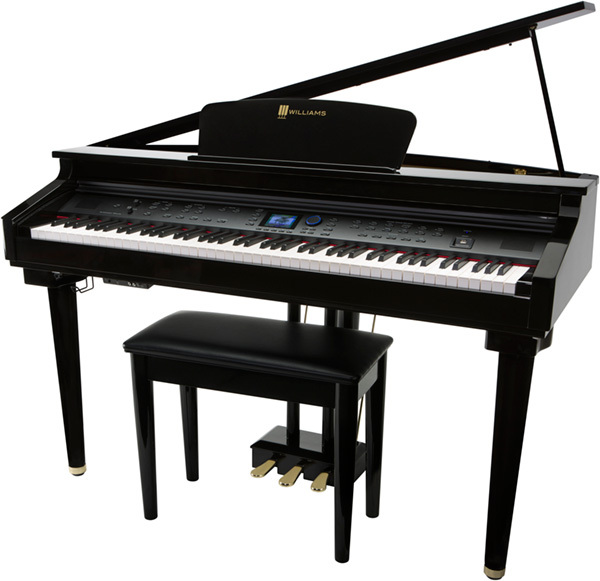 This micro-grand-style, 88-key, graded hammer-action instrument offers a luxurious ebony gloss finish, a stylish matching piano bench, and a realistic sound and feel.